Kontron introduced ULP-COM-sA3874i, another family of computer-on-module based on ULP-COM standards, based on Texas Instruments Sitara AM3874 Cortex A8 processors that aims to drive down system costs for ultra-low power SFF (small form factor) solutions in military, industrial automation/HMI, digital signage and medical markets. 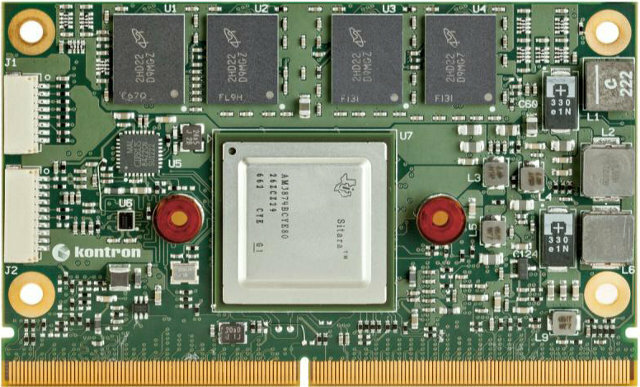 Main Memory – On-board 1 or 2 GB DDR3 depending on model. Graphics – Single Channel 18bit,24bit (18bit compatible) LVDS, and HDMI with dual independent displays support. Power Supply – 3V – 5.25V Operates directly from single level Lithium Ion cells or fixed 3.3V or 5V power supplies. Typical power consumption: 2 Watts. The company provides support for Windows CE6, WES7, Linux & Android operating systems. “BIOS” images, product change notifications (PCNs), 3D models for CAD, and software development tools are available to customers online. This is not specified in the press release, but as assume Kontron ULP-COM Evaluation Carrier Board can be used in conjunction with this module, as well as other ULP-COM modules such as ULP-COM-sAMX6i, for development purpose. The Kontron ULP-COM-sA3874i module family is available for sampling now with mass production planned for Q1 2013. For more information, you can visit Kontron ULP-COM-sA3874i product page.